Looking for a way to serve your kids all the delicious, juicy berries popping up this summer? This Fruit and Yogurt Parfait makes an easy, colorful snack perfect for busy summer days. Did you know berries are considered some of the world’s most powerful superfoods? They are rich in antioxidants, vitamins C and E, and phytochemicals, so you can feel good about serving them to your family—and your kids will love them! Cut the prep time for this recipe even shorter by making multiple parfaits at once and storing them in your fridge for grab-and-go moments. I like to keep them on a low shelf so my kids can easily grab them when it’s snack time. Let your kids get involved with prepping these parfaits! Older children can chop the strawberries, and younger ones can help assemble the ingredients in the jars. I love partnering with Sabra to bring you this recipe that encourages families to eat more good-for-you fruits. 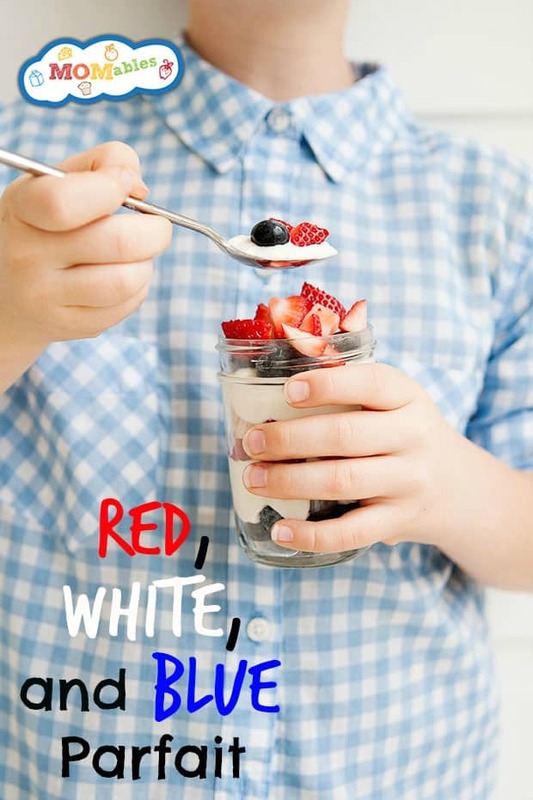 It’s a refreshing snack for the whole year, but the patriotic colors of this parfait make it great for the 4th of July! To make it easier for you to plan your Four Course 4th celebration, Sabra has collected some delicious recipes for appetizers, salads, main dishes, and desserts for a menu that will impress all of your party guests. Sabra is giving away a $100 Visa gift card and a box of Sabra products to one lucky reader! You know by now that I live off of Sabra hummus, so I’m very happy I get to share their delicious products with you! I hope you make this berry parfait from The Best Homemade Kids’ Snacks on the Planet and enjoy it as much as my family does. I just made the flatbread pizza…it was amazing!! It’s a toss up…. the creamy bruschetta dip looks wonderful, but my kiddos would like the s’mores dip. Happy 4th! The Creamy Bruchetta Dip Recipe looks amazing. I’d like to try the grilled veggie Flatbread. Adding hummus (more nutrition) to an already pleasingly well rounded item sounds like a winner. Can’t wait to try. I’d love to try the Stacy’s Chorizo Sliders Recipe!! The grilled veggie flatbread looks so easy and DELICIOUS! I can see myself eating a whole batch of that in one sitting, haha! Grilled Flatbread With Hummus & Mixed Veggies! I would love to try the Smores Dip! The recipe I am going to have to whip up for my family is the Basil Pesto Hummus Pasta Salad Recipe. I can’t wait to try this one. Using Hummus as the “sauce” for the flatbread, or even a pizza, is a great idea! I will like to make Grilled Flatbread with Hummus & Mixed Veggies Recipe. Oh, love the “Grilled Flatbread With Hummus & Mixed Veggies” .. thanks for the chance. The individual 7 layer dip looks elegant yet easy to make. The Mediterranean Chicken Burgers Recipe sounds really yummy and it would make a great summer meal! Grilled Flatbread With Hummus & Mixed Veggies Recipe! Sound yummy!!! Oh my goodness, the S’mores Dip Recipe looks heavenly to try! The the Cucumber Avocado Salad looks really refreshing. Grilled Flatbread With Hummus & Mixed Veggies Recipe Looks delish! I know the adults would love it and it’s a new way I could introduce the veggies to the kids. I would LOVE to try the Grilled Flatbread With Hummus & Mixed Veggies Recipe!! The original seven layer dip looks so fun and delicious! Southwest Parfait. So. Much. Yes. You had me at guacamole and hummus but add black beans, corn, rice, tomatoes, AND red bell peppers??? Madness…. Both my kids would love the grilled flatbread! I think we will add it to our menu for 4th of July! I can’t wait to try the chocolate coconut Carmel pastries!! Using hummus in sweet dishes is that something extra special I love to add to recipes. The s’mores dip sounds fabulous. The cucumber cups look so refreshing and easy to make. Right up my alley! The s’mores dip looks yummy! S’mores Dip! It looks so yummy and easy to eat! No more sticky hands! I’m going to try the marinated chicken kabobs! We love to grill and these look like fun for our daughter to eat. She can help put them together with us! The S’mores Dip Recipe looks like the one for me and my family, we love the sweet stuff. the bruschetta one sounds great! I would love to try the Mediterranean Chicken Burgers. I made the cucumber and avocado salad. My 7 year old loved this dish, he loves cucumbers and avocado. We are making the s’more dip for the 4th. I’m definitely going to try the cucumber avocado salad! Healthy and refreshing! I’d like to make the Grilled Flatbread with Hummus and Mixed Veggies. My parents are dairy and meat free, so this would work great for a family get-together. The S’mores Dip recipe would be a big hit at my house. My garden fresh tomatoes would be great in the Creamy Bruschetta Recipe! The grilled veggie flatbread looks amazing! The cucumber avocado salad and the chipotle-hummus dressing…I’m hungry now. The Cucumber and Avocado salad sounds delicious. It contains my two favorite vegetables. Definitely will try this recipe. The 7 layer dip looks delicious– hummus, herbed yogurt, veggies and feta, oh my! Sabra cucumber salad is on my list now! Cuke avo salad for this post partum mama and her toddler! The cucumber avocado salad looks AMAZING. I’m love all things dip, so that Creamy Bruschetta Dip is a must!!! Everybody loves the cucumber avocado hummus! It looks the yummiest. The S’mores Dip looks amazing. I’m obsessed with any s’mores recipe! The Mediterranean Chicken Burgers look yummy! The smore’s dip for sure! Thanks! We have to make the smore’s dip! I would love to try the marinated chicken kebabs. Reminds me of one of my favorite Mediterranean restaurants!! I can’t wait to make the Creamy Bruschetta Recipe! My family loves dips and if I can sneak in some healthy, delicious ones I consider that a bonus. I will be dining with friends this 4th of July so I will bring the cucumber cups and the loaded chopped salad over to share. However, I am now on the lookout for the chipotle hummus since I have not seen that at my stores here in AZ. Do you think I could add chipotle flavor to regular hummus to achieve the same result? I have never even thought of using hummus in dessert, so that spiced hummus cake would be interesting! I would love to try the Individual 7 layer dip. Looks wonderful! I think the Cucumber Avocado salad and the S’Mores Dip recipes sound yummy and would be perfect for our family reunion being held on July 4th. The mini apple pies look wonderful! The individual 7 Layer Dip would be great for the 4th of July!! It’s healthy and I love the little cups, what a great way to serve at a bbq or 4th of July party What an awesome idea!!! I would definitely make the s’mores dip! Looks so yummy! The southwest west parfait looks great! Yummy Grilled Flatbread with Hummus and Veggies! Mmmmm! The Mediterranean chicken burgers look amazing! The cucumber avocado salad looks like a great refreshing summer side dish. We love all kinds of pizza! I am with the group looking forward to taking the time this weekend to make the flatbread hummus variety. The grilled veggie flatbread looks awesome! The cucumber/avocado salad looks really good too! S’mores dip… perfect for summer birthdays! Yum! Mmmm, S’mores Dip sounds delicious…. Definitely the flatbread pizza – looks amazing. I will have to make it cheeseless though! My kids love these parfaits too! My kiddos would love the smore’s dip! The Mediterranean Chicken Burgers look delicious! Bonus: I don’t think the kids will put up much of a fight. I would make the cucumber avocado salad! I’ve never used hummus in a sweet dessert! The Smores dip sounds amazing! I also love the individual 7 layer dip. Cute for baby/wedding showers. The grilled veggie flatbread is the first recipe I would love to try…but so many of them look delicious! I’d love to try the s’mores dip, but since weare doing the meat for our BBQ this year, I’ll start with that recipe! I’m making the cucumber avocado salad! Yum! The smores dip looks so yummy. Gotta try the s’mores dip. It will be a great addition for our next Girl Scout meeting. The smores dip and the seven layer dip look great for the holiday weekend celebration along with the berry parfaits! Oooh must make the Smore’s Dip! The Cucumber Cups were just added to our menu for this week. That s’mores dip sounds amazing and easy! And, using the Stacy’s® Simply Naked® Cinnamon Sugar Pita Chips would make me feel a little better about eating the dip! The Flatbread veggie pizza looks great! About the parfaits, how long do they tend to keep in the fridge if you make a batch ahead? The cucumber avocado salad sounds really good and easy. I’m sure even a kid could handle making this one! I would love to try the Grilled Veggie Flatbread!! The grilled flatbread with veggies is right up my alley. I can’t wait to try it. I would start with the Grilled Flatbread with Hummus & Mixed Veggies Recipe and follow up with S’mores Dip Recipe for dessert. Absolutely the s’ mores dip! My favorite hummus recipe is yours. I love avocado, hummus, feta, olives and a drizzle of Greek dressing. The southwest parfait looks like a great one to try! Grilled flatbread sounds amazing, also smores dip – much better than the other smores dip with just choc chips and marshmellows baked on top! The basil pesto hummus pasta salad and the s’mores dip look super tasty! Yummy I think the Mediterranean chicken kabobs will be on our 4th of July celebration! Thanks for the recipes! Happy 4th to all! Need to make the boneless chicken Breast skewer recipe for weeknight dinners! The cucumber salad looks delicious and I think we will try it this weekend!! The grilled veggie flatbread looks like a great way to eat our veggies! My cousin and her family are coming into town and those individual 7 layer dips look perfect to avoid the little double dippers. Haven’t seen them in 4 years and I’m so excited she can meet my 2 little ones. Mmmmmm, Mini Apple Pies, please!! All looks yummy ! S’more dip will be one of our favorite. The Cucumber Avocado Salad looks yummy so will have to make it this week! The basil pesto hummus pasta salad looks amazing, and is a must make! I can’t pick just one; we love hummus!!! It’s a toss-up between the cucumber avocado salad and the southwest parfait. Maybe I’ll just have to make both! Thanks for the chance to win. The flatbread pizza looks fantastic! The cucumber cups look so easy and fun! I know my kids would love to pop them in their mouths on the 4th, and what a great idea for lunches and snacks! Super easy! The Creamy Bruschetta Dip looks great!! I plan to make the smore’s dip for the 4th of July as that looks like it would be easy to serve and very tasty. That hummus cucumber cup looks so good that I want to race out and make it now!! The cucumber salad with avocado! Mmm! We are an avocado lovin family! The cucumber avocado salad looks so good and I’d like to make it. I want to make the cucumber avocado salad. It is so hot here and this sounds so refreshing! The Individual 7 Layer Dip looks delicious and is a festive appetizer! They all look really yummy, but if I had to choose it would be the flatbread. I can’t wait to make the grilled veggie flatbread! My family will love it!! I would have to make the individual 7 layer dip! It looks amazing! The sweet tooth part of me says that the S’mores Dip is the way to go. Grilled veggie flatbread sounds great, but cucumber salad sounds amazing in our over 100 degree weather. I would make the complete 4th spectacular menu! yummy! The cucumber cups with hummus sound wonderful! The Loaded Chopped Salad with Chipotle-Hummus Dressing looks really good! Cucumber Avocado Salad sounds great! Southwest Parfait – looks delicious!! The first one I have to make is the cucumber cups with hummus. I love English cucumbers on hummus sandwiches. Thanks for the ideas. Ooohhh, I am definitely all about the S’mores Dip Recipe. Gotta try this one! P.S. love the yumbox idea going to check out their website. Mm mm…it all looks so good! Cucumber avocado salad and the individual 7 layer dips are definitely on my list for our 4th of July party. grilled veggie flatbread- looks yummy! The loaded chopped salad with the chipotle hummus dressing looks delicious. Always looking for a great salad! Mini Apple Pies sound good. What is more 4th of July than apple pie? Grilled Veggie Flatbread sounds delish! I always love a cucumber salad for summer time! Yummy! I’m going to try the Basil Pesto Hummus Pasta Salad with the Mini Apple Pies for dessert! Thanks for the giveaway. Hubby LOVES Sabra Hummus! I love salads especially in the summer so the cucumber avocado salad is the one I pick to do and because I love both cucumbers and avocados it’s a must to make. It doesn’t really involve any cooking but I would still make it because it’s so good for you. I would definitely make the grilled veggie flatbread. They look Delish! Definitely the Southwest Parfait, it looks amazing!!! I’m a fan of pasta salad so I would want to make the basil pesto hummus pasta salad! I would have to make the smore’s dip! I cannot imagine using hummus in cake. I am quite singular in that hummus is a dip, thats it, a dip. I cant wait to try hummus cake. S’mores dip! Sounds like a bit of a splurge but fun for a holiday get together. I’m a sucker for a 7 layer dip recipe, and the Individual 7 Layer Dip looks like a fun way to fancy that up! Spiced Hummus cakes looks so cool! Cucumber avocado salad sounds delish! Everyone in my family loves avocados, and they’ve been getting more used to cucumbers lately, too. Maybe the kids will like it, too! I’d like to try their recipe for Grilled Veggie Flatbread. That Grilled Veggie Flatbread looks so tasty! The Marinated Chicken Kebabs along with the layered dip sounds delish! I’m a 4th of July baby so I may just try this one for my b-day bash! Marinated Chicken kabobs – YUMMY!!! I can’t wait to try the smores dip. The chicken burgers look great! I want to make those. Didn’t think of putting hummus as a condiment like that. The Creamy Bruschetta Recipe sounds absolutely delicious! A must try recipe! The works menu looks really good. I will have to try these. I am gonna try the berries and yogurt parfait. My nephew loves each of those separately. I haven’t tried to them together yet. He’s a very picky eater. The Grilled Veggie Flatbread is my choice. Love that it doesn’t contain the traditional red sauce (grandson won’t eat) and includes lots of delicious veggies. I’m excited to share with the whole family! Hum, let’s see, what to pick? So many recipes sound delicious but I will have to try the Marinated Chicken Kebabs. Grilled Veggie Flatbread! Looks delicious!! I would love to try the bruschetta dip! The coconut, chocolate, caramel pastries look so interesting! The grilled Flatbread. Absolutely! Printing out receipe now! The grilled veggie flatbreads sound amazing! The grilled veggie flatbread looks amazing and what a great way to get the kids to eat more veggies. I want to try the Creamy Bruschetta! Looks easy and delicious!! Happy 4th All! The grilled veggie flatbread looks so amazing! I love to use thinned out hummus as a salad dressing, too! Def will be trying the S’mores Dip! Oh, I so need to make the marinated chicken kabobs and mini apple pies. Yummy! I’m torn! S’mores Dip sounds AMAZING but I think the Bruschetta Dip is a neat way to use the Hummus and I’ve never tried the Pine Nut Hummus (I’m a tried and true Red Pepper Hummus girl myself). The key is which one is more likely to have people shoving each other out of the way to eat! I’m going with the Bruschetta Dip because the grown-ups would be too polite to arm wrestle over the S’mores Dip (at least in public)! Just one? I’d love to try the Grilled Flatbread With Hummus & Mixed Veggies Recipe and the mini apple pies. Grilled veggie flatbread is my choice: I can vary the ingredients so everyone will eat it! I just have to cook the Mediterranean Chicken Burger. For sure it would be the grilled flatbread pizza. Best way to get all the veggies I can in my kiddo. For the adults would have to be the chorizo sliders. Yum!! Sorry it was hard to pick just one!! The cucumber salad looks yum! Feast of the 4th, cucumber and avocado salad!! I have one from each course picked out. Such great recipes!! I want to make the Cucumber Avocado salad!